Since their establishment in Louisiana, the Cajuns have developed a vibrant culture that encompasses art, music and cuisine, as well as their own dialect of Cajun French. For those unfamiliar with the lifestyle we lead in this unique cultural mecca, it’s truly unlike any you’ll find elsewhere around the country, even New Orleans, a mere two hours east. In fact, even gumbo has a completely different flavor between Lafayette and New Orleans, the difference stemming from Cajun vs. Creole cuisine. The beautiful and rich Cajun community is known for having a vibrant “joie de vivre,” (joy of life), celebrating a balance between working hard and playing hard. They are famous for hosting an internationally acclaimed five-day music festival, actually, a festival celebrating any and every aspect of regional culture, from its Creole and Cajun heritage to agricultural highlights, cuisine, dance, and art – quite different from the pirogues rowing bayou dwellers in tattered plaid as is often stereotypically depicted in the movies. There is also a fierce pride that runs through the Cajun people, probably stemming from a long history of survival. Originally from Acadia, the Nova Scotia region of Canada, those French settlers were unceremoniously uprooted from their homes and sent down the Mississippi River in boats in the 19th century for refusing to pledge allegiance to the British king. Many eventually amassed and settled in South Louisiana, surviving by learning to live off the land. Given this new tenuous environment, it is remarkable how far the Cajuns have journeyed, making an indelible impact on American history, sharing their tenacity to flourish in everything from their music to their cuisine, which is fast gaining popularity everywhere. Generations of families still live on the same lands their ancestors did, and wouldn’t dream of moving elsewhere; where else would they find a place so rich in their own history? As in every family-centric society, life revolves around the dinner table; it’s not uncommon to have multiple generations gather for a weekly Sunday dinner together. And a large part of those meals has and continues to be prepared using the authentic flavors and products distributed by the Savoie’s Foods. From roux, rice dressing and Andouille sausage. 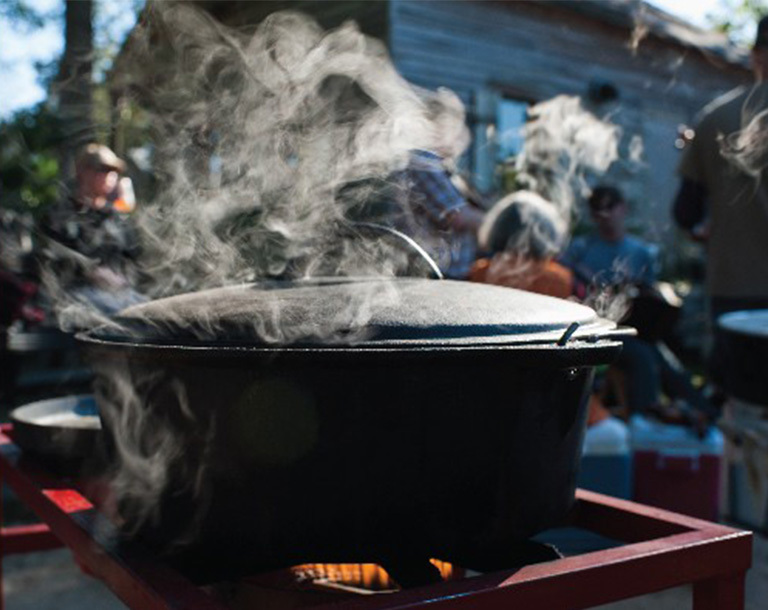 Savoie’s® food products are used throughout Cajun homes to bring authentic, time-honored recipes and mealtime traditions to life.